Last year was my first time to see this amazing beauty in person. We’ve had this for the past two mornings as well. I just can’t get over it. Magnificent. For the card, I wanted to use the Festive Flurry stamps and framelits, but I’ve seriously neglected my Snow Flurries Bigz die (retired) this year, so I decided to see if they would combine well. The sizes worked perfectly together! I stamped the biggest Festive Flurry flake in Versamark on Whisper White cardstock, then added Heat & Stick Powder [the first time I stamped it, I forgot to add the Heat & Stick, even though I had the jar ready, lid off and everything — yeah, it didn’t work so well! ], melted that with the Heat Tool, then poured on Dazzling Diamonds glitter and heat set it with the Heat Tool. Cut that out with the framelit. On top of that I layered the largest snowflake from the Bigz die. Next I stamped the 3rd largest snowflake from Festive Flurry in Versamark on White Vellum cardstock, then embossed it with white embossing powder and the Heat Tool, and cropped it with the matching framelit. Next I added the middle snowflake from the Bigz die. Finally, I topped the whole flurry off with a Vintage Faceted Designer Button. I love those elegant buttons. I layered the snowflake using Dimensionals between each layer for extra depth. My card base and the embossed mat are Whisper White. I embossed the mat using the Woodgrain folder. I embossed the sentiment in Gold on Whisper White cardstock, then flagged the ends using my Paper Snips. I used one Dimensional on each end of the banner and two in the center so the banner has a little curve to it. I love how the card turned out. I mean, really love. Like I’m not sure I can send this one out. :) I hope you love it, too! Have a great evening! Gorgeous, Sarah! I love how the retired Bigz die works with the Festive Flurry Framelits. Thanks for playing with The Paper Players! Sarah, this card is just stunning! 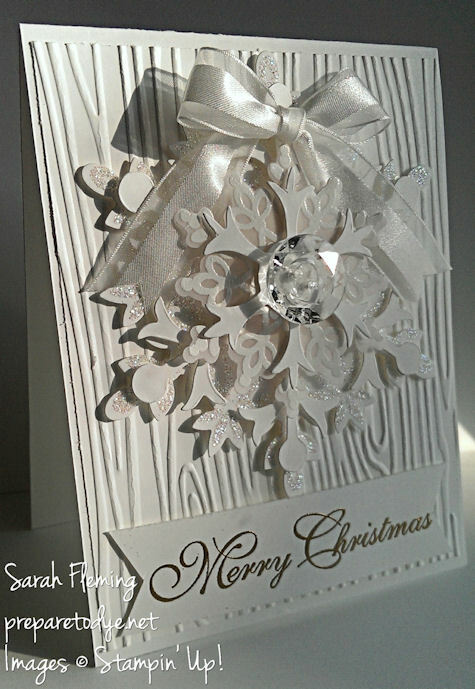 I love the texture of the woodgrain combined with the shimmer of the snowflakes and shine of the ribbon. An all around gorgeous card! 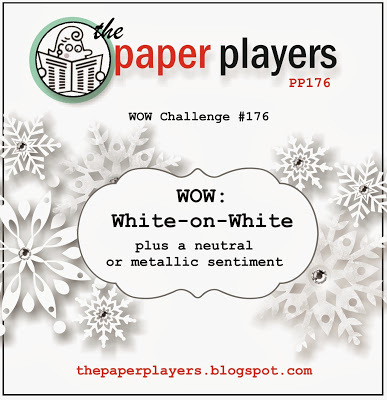 Thanks so much for playing along with my challenge this week at The Paper Players! This card is stunning!!! 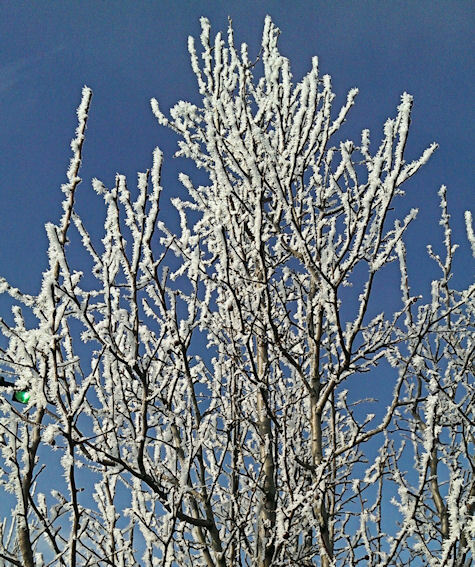 I too have been living in a snowglobe this past week and had so much inspiration right outside my window. I’m sitting down to make my white-on-white card today. I just love your card and may have to CASE it for remaining Christmas cards that I need to make. Thank you for sharing!